You'll be £14.99 closer to your next £10.00 credit when you purchase The Battle for Crimea 1941 - 1944. What's this? 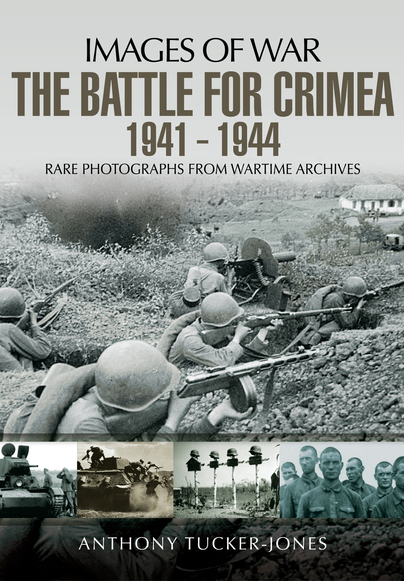 The selection of over 150 rare wartime photographs in this volume in Pen & Sword’s Images of War series offers a graphic visual record of the dramatic and bloody battles fought for the Crimea during the Second World War. They show every grim aspect of the fighting and reflect in many ways the ruthless character of the struggle across the entire Eastern Front. The German-led Axis forces took eight months to conquer the Crimea in 1941-2 – the Soviet defenders of the fortified city-port of Sevastopol held out against repeated assaults for 250 days. In 1944, after the course of the war had turned against the Wehrmacht and their allies, the city was liberated by the Red Army, but only after over 120,000 Axis troops had been evacuated across the Black Sea. Naval operations involving the Soviet Black Sea Fleet and the Romanian Royal Navy are covered in the book, as is the battle in the air between the Luftwaffe and the Red Air Force. But perhaps the most memorable photographs give an insight into the ordinary soldiers’ experience of the fighting and show the enormous material damage the conflict left behind. This study of the Crimea campaign via photographs is another outstanding work by Tucker-Jones in the greater Eastern Front Images Catalogue series. There are several reasons why I feel this text easily reaches the high standards of previous works by the author. It covers a lengthy time period opening with the German invasion of Russia until late in the war during the 1944 Red Army re-conquest of the south. The Air War and Naval aspects are both covered in addition to a telling timeline of all the land operations right down into such detail as the Soviet versus German infantry man in close combat trench warfare. At 128 pages it is difficult to imagine better coverage of the campaign as well as most of the weaponry utilized during the various different stages in which this campaign went through. The photo collection is once again stellar, crisp and varied, while Tucker-Jones writing style captures the action and maintains a fast moving flow as well as an intensity which captures the furious combat accurately. In presenting this campaign the written text is brilliant, while the photos themselves are well chosen and have a great impact for the reader, gritty and hard hitting and the portrait or burial photos deliver the human aspect of the harsh environment which characterized the theatre. This material lends itself to further and deeper study of both individual battles as well as the larger campaign which again we see as a strong point of the larger series works by Pen and Sword Publishing. This is a text I would greatly recommend to a broad segment of historical readers; both students and academics, general enthusiasts and the scale modeling world of which I see more and more use of these photo works gaining popularity. This book provides a good investment for price to substance, well written and highly engaging it is a very good value. It brings an interesting topic into ones Eastern Front library and I found re-reading segments always throws up additional facts. Tucker-Jones does a fantastic job in telling both sides of the campaign while pulling no punches in his evaluation of both command and operations. In my mind this is an excellent complement for anyone interested in gaming the eastern front who wants to explore other battles than the usual suspects. The photos give you a good feel of the troops involved and their equipment as well as inspiration for terrain. The only thing I felt missing was a map of region, but it's relatively easy to find one on the internet. Highly recommended. The ‘Images of War’ series is one of the best ideas that Pen & Sword have ever had. While, of course, word are important, as this fine series shows, an image really is worth a thousand words, and this book has over 150 images. Crimea has seen much blood spilt over the years, the Crimean War springs to mind, and our course, General Baron Wrangel made his final brave stand against the red Army during the closing acts of the Russian Civil War (now, that would be a good subject for an Images of War book). The years of hard fighting from 1941-44 is shown from both the Russian and German point of view and the photography and reproduction is of the highest standard. Anthony Tucker-Jones’ text is spot on, it tells you what you need to know, but allows the photos to speak for themselves. Military modellers will find much here to interest them, both in groupings of equipment and contextual uniform detail: There are some good close-up portraits scattered through the book. The supporting naval operations are covered, with useful images of ships from both sides. The pictures give a flavour of the terrain and comprehensive devastation wrought on Sevastopol. Wargamers will find that this book offers a good general read-in to the campaign, and gives an understanding of the considerable problems facing Manstein. Another well put together book from author Anthony Tucker-Jones. This one is filled with hundreds of quality photographs as well as clear and concise explanations as to what and where things are happening. The author clearly defines the operations taking place in the Crimea such as Operation Blue III which was the third major component in Hitler's 1942 summer offensive. Nothing beats seeing history as well as reading it. Another book that brilliantly combines both aspects.